We export and supply Frozen Buffalo Tail that is known for its freshness and quality. Frozen Buffalo Tail that we offer is extracted from the disease free buffalo and is properly cleaned before the freezing process is performed. Frozen Buffalo Tail is widely in demand for preparing various dishes and it can be refrozen for future usage. 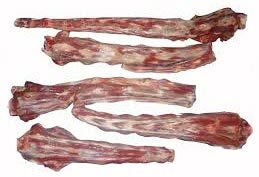 We provide Frozen Buffalo Tail in excellent quality packing for long-term storage.